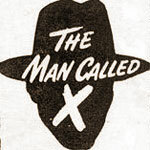 The Man Called X was an episonage, adventure drama broadcast from July to August, 1944. Herbert Marshall, a British actor, played the lead role Ken Thurston as an international troubleshooter and intelligence agent. The theme music composed by Johnny Green is outstanding. The series features Thurston hopping around the globe to solve mysterious cases. Dubbed as "the man who crosses the ocean as readily as you and cross town," Ken Thurston, the man called X, deals with problems involving, such as, secret government operations, smuggled guns, explosives, drugs, art theft, murders, kidnappings, and sabotage. There is also an element of romance thrown in the plot, involving women with sordid histories.